she is a wee wonderful!! What a dress! Did you make that? Cute :). A much cheerier expression, indeed! The shirt’s adorable, too. Um…wasn’t she just born, like, a year ago?! How time flies! Hope she has a great time at preschool this year! Exactly what Janelle wrote. 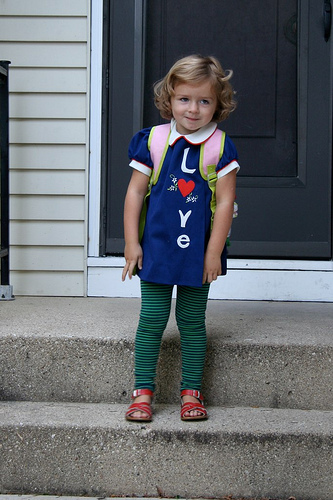 I swear she wasn’t born but a short while ago, and now she is off to preschool? Crazy stuff. Preschool already!?!? 🙂 What a cutie!! What a cute lil bug! Hope she has a fabulous time at preschool! Oh my gah, baby black faux-hawk! Where has the time gone? That 50’s paper doll hair is so adorable and perfect. You’ve got some cuties on your hands, for certain. So, it must be gratifying to know that you have the cutest child in the universe. Holy cow! hooray for preschool and happy little preschoolers..
Oh boy… I remember when she was born. I was huge and only a few weeks away from my due date and I almost cried looking at her baby picture. She’s beautiful, and she also looks smart as a whip with that sideways smile and that look in her eyes. She’s adorable! Where did you get her “love” top? Did you make it? Oh she is such a little cutie. I cant believe how fast the time has gone since you had her either! E-bit starts tomorrow. She is sooo excited. Hope June babies 1st day was awsome! she looks so tall! And cute! It really doesn’t get much cuter than that. Adorable! Very, very cute. And OMG I remember when she was born! Please tell me my own daughters’ lives won’t go so fast. Please? Goodness! It seems like it was just yesterday that this little cutie was a tiny baby. Can’t believe she’s off to school already! It seems like only yesterday she was born! She really is a stunner and she looks just like the dolls you sew. Perhaps you fashioned her in the same way and she just came to life? Awwww! what a sweet picture. Just beautiful. Ohmygoodness! I can’t believe how much she looks like one of the little old-fashioned girls from one of the paintings in my grandparents’ house when I was little! Maybe it’s the curls or the cheeks, but wow. What a classic little beauty!